June 2nd is solidarity day – support your fellow Union workers! Verizon employees have been on strike for over a month. 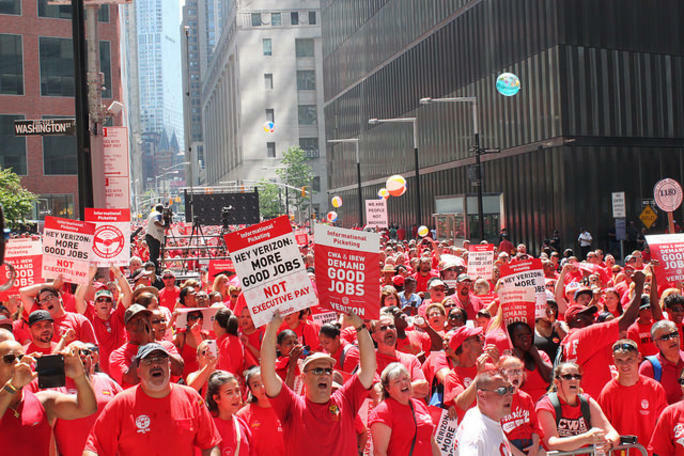 Verizon’s contract proposals attack working conditions, transfers and assignments. As an example, the company wants the right to transfer workers any where in the state for an unspecified length of time. The proposals aim to gut the contract’s protections. Plan to show your support on June 2nd by joining a picket line, dropping off water or snacks, displaying a sign showing that NYSUT supports Verizon workers, or just stop to identify yourself as a teacher and say hello . Your support will be greatly appreciated. Reminder: This Tuesday is state wide voting for School Budgets and Board of Education members. Local NYSUT unions across Long Island are urging YES votes on the budgets and endorsed candidates. The UTN has endorsed incumbents Julia Binger and Andrew Rapiejko as well as candidate Allison Noonan. Click here for the names of local endorsed school board candidates for other Long Island districts.